Already have a Username/Password for Structural Mechanics of Engineering Constructions and Buildings? Paper must be prepared strictly in accordance with requirements given below. Papers not complying with them will not be accepted. Authors are responsible for scientific and grammatical correctness of papers. Papers may be of either applied or basic character. Papers are submitted as files prepared in MS Word (.doc or .docx); the text should be in Times New Roman, 11 pt, with one interval; upper and lower margins are 34 mm, left and right margins are 38 mm. The dimension of the text field is 23×13.5 mm. an abstract of the paper and key words. KEY WORDS : from 5 to 10 words, Roman type. In specific cases, it is acceptable to use two- or-three-word terms. Text of the Paper: Roman type, 11 pt, one interval. Be sure to use an automatic transfer. List of references: references are numbered in order of their appearance in the main text; the surnames and initials of the authors and titles, names of the journals and collections are in italics. Equations should be numbered consecutively and equation numbers should appear in parentheses at the right margin. Italic type is used for Latin symbols and normal type is used for Greek symbols. An interval of 3 pt should be between the equations and text. Small figures are placed within the text, preferably by means of Word or graphical tools. The figures and inscriptions on them should be grouped and do not disintegrate when they are removed. Figures are separated from the text by an interval of 6 pt. Editors have the right to decline a paper if it doesn’t satisfy the specified requirements, or if the paper received two negative reviews of reviewers, or of members of the Editorial Board. Compliance with citation rules and borrowing rates from other texts. The Federal State Autonomous Educational Institution of Higher Education "Peoples’ Friendship University of Russia” (RUDN), represented by the Vice-Rector for Scientific Work Nur Serikovich Kirabaev, acting under a Power of Attorney dated № 44-09/16-144 от 27.07.2016 г., hereinafter referred to as the Publisher, on the one hand, hereby offers to the public at large, hereinafter referred to as the Author, on the other hand, hereinafter collectively referred to as the Parties, to enter into this agreement, hereinafter referred to as the Agreement, regarding publication of scholarly materials, hereinafter referred to as the Article, in the Journal named 'Structural Mechanics of Engineering Constructions and Buildings', hereinafter referred to as the Journal, under the following terms. 1.1. Pursuant to Clause 2 of the Article 437 of the Russian Federation Civil Code, this Agreement shall be recognized as the public offer, hereinafter referred to as the Offer. Subject to Article 438 of the Russian Federation Civil Code, this Offer shall be deemed to have been completely and irrevocably accepted after the Author had submitted his/her materials by uploading those onto the network electronic system of the article acquisition for review available at the respective section of the Journal's site at URL: http://journals.rudn.ru/index.php/structural-mechanics/author/submit/1 on the Information and Communication Network known as the Internet, hereinafter referred to as the Internet. The Offer Acceptance means a complete and irrevocable acceptance of the Offer under the terms specified in Clause 3 hereof (the Author accepts the Offer by submitting an application to the Publisher, i.e. 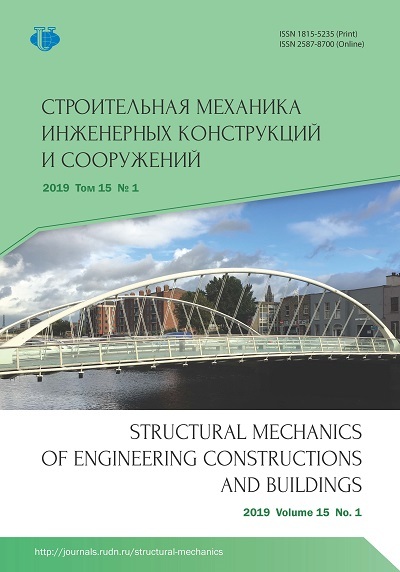 by uploading the Article along with support materials onto the network electronic system of the article acquisition for review available at the respective section of the Journal's site at URL: http://journals.rudn.ru/index.php/structural-mechanics/author/submit/1 on the Internet). The Journal means an academic periodical named 'Structural Mechanics of Engineering Constructions and Buildings'. The Application means an electronic request of the Author addressed to the Publisher for publishing the Article in the Journal by uploading the Article and support materials onto the network electronic system of the article acquisition for review available at the relevant section of the Journal's site at URL: http://journals.rudn.ru/index.php/structural-mechanics/author/submit/1 on the Internet). The Offer means this document (offer to the Author) to publish an Article by uploading it onto the site at URL: http://journals.rudn.ru/index.php/structural-mechanics/author/submit/1 on the Internet. The Article Requirements mean requirements to the materials published in the Journal's section named "To Authors" of the Journal's site at URL: http://journals.rudn.ru/index.php/structural-mechanics/about/submissions#authorGuidelines on the Internet. 3.4. This Agreement shall become effective from the time the Article is submitted to the Journal, i.e. uploaded along with support materials onto the network electronic system of the article acquisition for review available at the relevant section of the Journal's site at URL: http://journals.rudn.ru/index.php/structural-mechanics/author/submit/1 on the Internet, hereinafter referred to as the Article Upload. 3.7. The Publisher undertakes, throughout the currency of this Agreement, to provide to the Author the services associated with publication of the Article on the Journal's site at URL: http://journals.rudn.ru/index.php/structural-mechanics on the Internet. 7.2. If the Author disagrees with any modification in the terms of this Agreement, the Author shall have a right to submit a written notice of his/her withdrawal from this Agreement by uploading it onto the network electronic system of the article acquisition for review, available at the relevant section of the Journal's site at URL: http://journals.rudn.ru/index.php/structural-mechanics/author/submit/1 on the Internet.